Campagnolo Offers 'Pro' Version of Shifters to ConsumersSpecial Ergopower controls made for the professional teams are to be sold in a limited series. There will be 600 pairs and they will only be sold as complete Record groupsets with the same specifications as those of the racing teams: 39/53 crankset and 11-23 or 12-25 sprocket set. Even though the peculiarities of these special Ergopower controls are in clear contrast to what the market has been asking for in recent years (softer and lighter actuating force), the demand has been conspicuous. It would in fact appear that some cyclists wish to feel the same sensations that professionals get when they are on their bicycles and want sharper shifting. 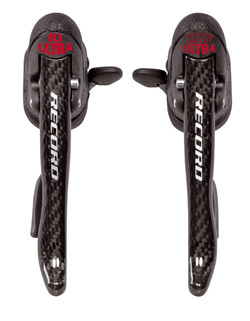 The Record groupsets with special Ergopower controls will be available starting from mid March and at the same price as the standard Record groupset. Great Western Bicycle Company Ltd. Check with your local retailer for availability.